Professional styling product brands Eva NYC and Kiss New York have arrived in Manila via a New York-style rooftop welcome party held at the Sky Park in SM Aura Premier. Born in Brooklyn in 2012, Eva NYC empowers women one strand at a time with a full line of styling tools and hair care products. 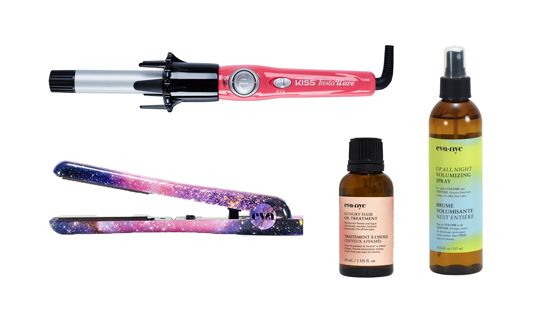 Kiss New York, meanwhile, brings professional salon treatment directly to the consumer with a collection of products that are easy to use at home, or on the go. Bannering the launch event were #EvaElites Jayda Zaragoza, Sarah Carlos, and Alyssa Gibbs. On the other end, Kaila Estrada, Jennica Sanchez, and Arisse de Santos comprise the #KissKlique for Kiss New York. The venue was adorned with hanging patio lights to go with the sunset ambiance and good music, typical of a chic New York rooftop party. There were surprise performances, hairstyling corners, and a lot of fun at the event, where cushions, seating, and table arrangements carried design touches of the brands’ colors: pink for Eva NYC and red for Kiss New York. Eva NYC and Kiss New York’s hair care and styling products are now available in the Philippines. Andy Crocker, Gorgeous Dawn, and Minty Fresh opened the night, which was also attended by Tony Chua, president, and chief executive of iFace, Inc., the exclusive distributor of Eva NYC and Kiss New York in the Philippines, and Angela Goyena, the group’s general manager. The local distributor brings to the country the brands’ products including Eva NYC’s Hair Therapy Session Hair Mask (straightens hair), Up All Night Volumizing Spray (revitalizes dull and lifeless hair), Hungry Hair Oil Treatment (repairs and hydrates hair), Healthy Heat Ceramic Straightening Iron, and Tone it down Blonde Shampoo, Conditioner, and Leave-in Treatment, among others. Kiss New York’s InstaWave 101 (user-friendly salon-quality curler), Comb Straightener (detangles, straightens, volumizes hair), Stick on Press & Go Nail Tips, Eyebrow Stamp, false lashes, and others are now available in the country. 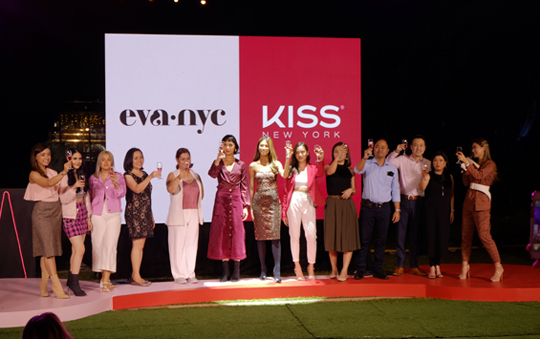 From left: Eva NYC and Kiss New York brand ambassadors and iFace, Inc. officials at the launch of the New York styling brands. Eva NYC and Kiss New York products are available at Watsons and SM Stores nationwide, as well as online at www.beautybeat.ph.